then it all falls apart!! Raj knows the prophecy, knows that he’s Winnie’s destined true love – so why is he with Jenny?! Why does he get to chair the film festival when Winnie needs that honor on her film school applications? Wait, is her best friend keeping secrets now? Is her own Bollywood movie-loving life suddenly a dud? Meet Winnie as you read the first chapter free on the publisher’s website, then head for your local library or independent bookstore to see if her prophesied true love bursts into her life in the best Bollywood movie tradition! Any prophecies come true for you? Book info: My So-Called Bollywood Life / Nisha Sharma. Crown Books for Young Readers, 2018. [author site] [publisher site] Review copy and cover image courtesy of the publisher. My book talk: Meet her great love before she turn 18? Ha! When Winnie finds “perfect boyfriend” Raj with another girl, all she has left for their senior year is Film Club, but their new advisor is taking Raj’s ideas instead of hers! Not the Film Festival chair this year? She needs that on her resume for NYU Film School application! Her writing about great Bollywood movies will never be a career? Raj is such a jerk! Dramatic events at the Festival fundraiser dance have the whole school abuzz, the Indian community in their New Jersey town wonders about the prophesy, and Winnie must use the best of Bollywood’s plot twists to make everything turn out right. Jacklin wishes she could go to Europe like her sister did (why’d she come home?) or actually get paid for her job at the town’s failing grocery store. Is Ma just waiting for Jacklin and Trudy to leave town for good? Is renovating the old drive-in movie show with Jeremiah and Roly worthwhile? What about that guy camping in the suicide grove of the national forest nearby? Book info: In-Between Days / Vikki Wakefield. Simon Schuster Books For Young Readers, 2016 (hardcover), 2017 (paperback). [author site] [publisher site] Review copy and cover image courtesy of the publisher. Geek’s Guide to Unrequited Love, by Sarvenaz Tash (book review) – Romance or reality at ComicCon? Planning the best day ever at New York ComicCon! Telling her how he truly feels about her! Don’t wait till BookCon at NYCC to pick up this June 2016 release! Visit at your favorite local library or independent bookstore today to see if Roxy and Graham get any tips from famous cartoonists and if she ever figures out how he feels about her! Book info: The Geek’s Guide to Unrequited Love / Sarvenaz Tash. Simon & Schuster Books for Young Readers, 2016. [author site] [publisher site] Review copy and cover image courtesy of the publisher. My book talk: Graham realizes that he’s fallen for girl next door/ best friend /comic co-creator Roxy, but his plans to tell her on the perfect New York ComicCon day are foiled by a handsome British student. It’s a miracle that famously reclusive artist-author Zinc is scheduled to appear at NYCC, years after his legendary Althena comic went dark. It’s a tragedy that a cool Brit runs into their group and decides to tag along while flirting with Roxy! Graham and Casey can grab those limited-seating tickets for Zinc, right? How can Graham convince Roxy to sneak past her conservative parents and skip school for another day of ComicCon? Is there any way to get her away from Devin without looking like a jerk? Calling them “lies” is so…caustic. Colette stretches the truth about her movie-star mom, long-absent dad, and winsome little brother – to protect them, of course. Or to keep the world from discovering how unspecial she is. Or none of the above. Definitely an “unreliable narrator” here. Luckily, Sonya Sones is honest when she writes a “Dear Teen Me” letter to tell her younger self that her experiences would become part of much-loved novels-in-verse someday. Find Collette’s story today at your local library or independent bookstore, and decide for yourself if Collette can ever be honest, even with herself. 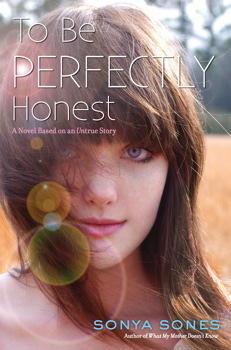 Book info: To Be Perfectly Honest: a Novel Based on an Untrue Story / Sonya Sones. Simon & Schuster Books For Young Readers, 2013. [author site] [publisher site] Review copy and cover image courtesy of the publisher. My book talk: Colette’s movie-star mom is entirely gorgeous, the 15-year-old isn’t, but invents some crazy tales to make herself more interesting. When it counts, though, Colette may have told too many lies to get ever back to the truth. Teen guys in L.A. seem interested in only one thing, but Colette refuses to be just another conquest. She might even miss their groping if Mom insists on dragging her and little brother Will along to the small town where her next film is being shot. She will die of boredom, truly. Thankfully, a gorgeous guy on a motorcycle starts talking to her in the town park. She certainly can’t let him know who her mom really is, so the stories start flowing again. Connor is so sweet and thoughtful, a great pal to Will, and so handsome. Colette senses that he has a secret sorrow, and it nearly breaks her heart when he finally tells her. Loving the most special girl in the world is on his ‘bucket list’ he says, and Colette is the one. Should she let Connor be the one for her? What if the doctors are wrong and his time is ticking away too fast? Would he still adore her if he knew how many lies she’s told him? a girl making up stories. Family reunion time – can you keep up with the conversation about all-time favorite books? It’s trivia night – are you ready? Discussion of “best-ever” movies – got one to contribute? With Daniel Harmon’s annotated, illustrated book filled with pop culture top ten lists, you can hold your own in the conversation, discover new (classic) films and music to enjoy, and yell at the book occasionally for leaving your favorite off a given list! Read a sample chapter “Eat, Pray, Love, Spelunk: Tag Along on a Life-Changing Vacation” here, and look for this June 2013 release at your local library or favorite independent bookstore so you can top-ten your way to pop culture knowledge. What top ten list would you create for the ultimate pop culture experience? My book talk: Want to outwit death, watch the world unfold, visit magical fictional worlds, or find speeches worth heeding? 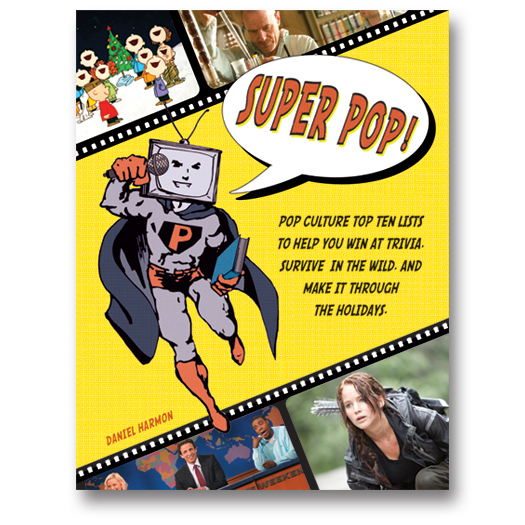 Super Pop has top ten media lists for all these pop culture topics and dozens more. From the serious to the sublimely silly, these “ten best” lists draw from the best (or worst) movies, video games, podcasts, books, television shows, and songs of the past several decades. What sets this apart from everyday top ten listings are the author’s thoughtful, funny, and often irreverent annotations explaining why each item made it onto a list. Zest Books editor Harmon divides his annotated lists into five groups – Be More Interesting, Get Smart(er), Stop Doing It Wrong, Find Happiness, and Survive the Holidays – and includes resource material for further investigation, lots of quirky sketches (like the TV-headed Charlie Brown regarding his spindly Christmas tree), and a great index. Whether it’s “pithy explanations of really complex things” or “smartest inanimate objects in the history of pop culture” readers will find intriguing lists of books, films, games, television shows, and music to increase their knowledge and appreciation of our shared modern-day culture – counted down from 10 to 1 in classic Top Ten fashion, of course. (One of 6,000 books recommended on www.abookandahug.com) Review copy and cover image courtesy of the publisher.